Raymond speaks about the importance of promptly improving aircraft cabin air quality in helping to prevent the spread of the next disease epidemic. 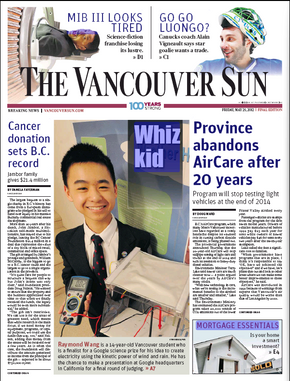 RayCorp's core mission focuses on raising funds for Raymond Wang's scientific pursuits. Since 2011, Raymond has been continuously developing innovations to solve real world problems in areas that include aeronautical engineering, renewable energy, human health, and environmental management. 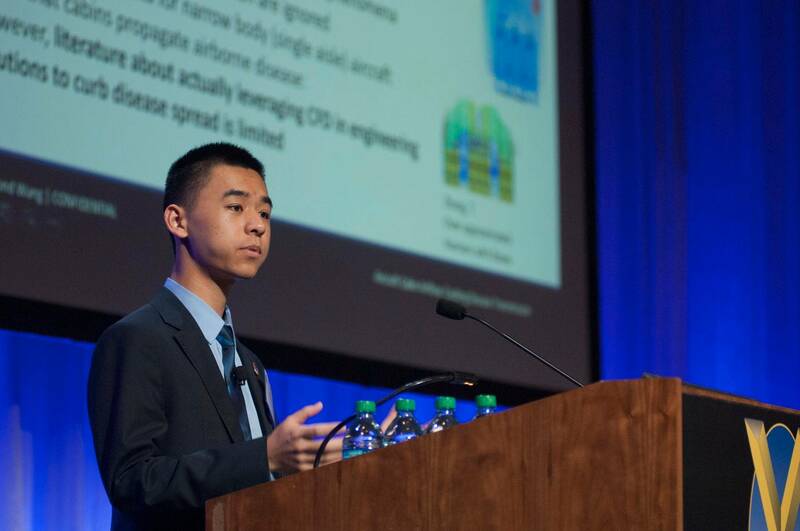 All funding and donations resulting from RayCorp's various activities are directed towards advancing Raymond Wang's continued development of the innovations below, with the goal of entering real world production. Abstract: Recent Influenza, SARS and Ebola epidemics invoke fear of infection among billions of air travelers worldwide. Isolated air in densely packed aircraft cabins propagate disease via direct airborne and large droplet routes; treatment and contact tracing of exposed passengers incur substantial socioeconomic costs. Current understanding of cabin airflow in industry is constrained by low resolution empirical measurement equipment and unphysical Computational Fluid Dynamics (CFD) predictions that lack attention to cabin detail and interactions among multiple physical phenomena. This interdisciplinary project pioneered high-resolution CFD simulations of pathogen flow in aircraft, using a coupled implicit finite volume solver. Precise 15 & 20 million cell Boeing 737 cabins, with seated human mannequins, were modeled referencing official technical drawings and statistical anthropometric data. Employing a multi-iterative systems engineering approach, 32 cabin airflow scenarios were analyzed, considering the Navier Stokes equations along with convection, turbulence, and other phenomena. Two solutions emerged from CFD testing: an innovative global cabin inlet system which increases passenger fresh air availability by over 190% and reduces pathogen inhalation concentrations by up to 55 times versus conventional designs; and a novel bulkhead outlet system that generates local high filtration zones which isolate pathogens emitted by high-risk passengers. Physical testing and feasibility studies with real world models concurred with CFD findings. Both economically feasible innovations leverage existing cabin infrastructure to enable rapid installation, thus improving breathing air quality and efficiently curbing disease transmission in modern aircraft. Abstract: The energy crisis and the severe weather are two of the biggest problems facing us today. Precipitation contains potential energy, and wind has kinetic energy. A piezoelectric roof was innovated that had a potential to be widely implemented to harvest and store weather energy. Experimentation timed the speed the Weather Harvester collected a specific amount of energy under actual weather conditions. Results proved my innovation feasible. Further research is carried to improve the innovation's efficiency. 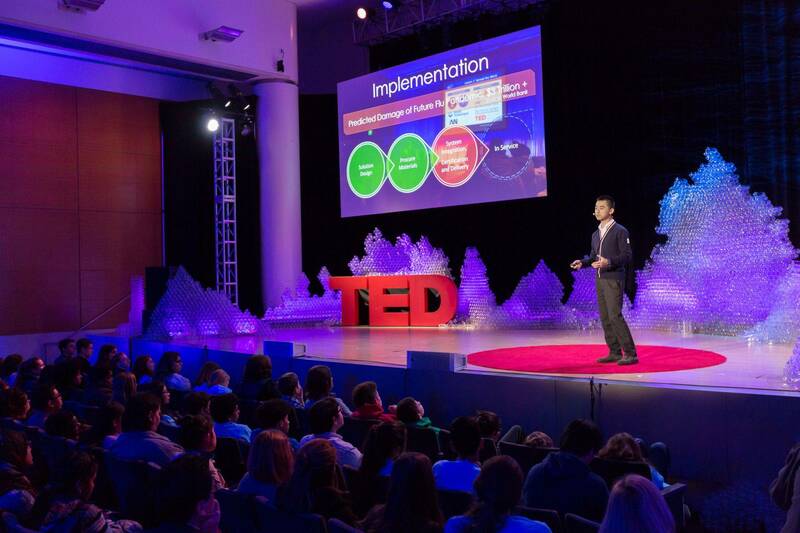 Video: Raymond Wang was invited to present a model of the Weather Harvester as a speaker on TED. Abstract: Knee conditions are a prominent health issue. Through analyzing the typical biomechanical movement of the legs during stair-climbing, a Magneto-Rheological composite support core, coupled with a movement responsive control system, was innovated as the solution. In contrast to traditional knee orthotics, the Smart Knee Assistant provides dynamically adapting knee support. Tests proved my innovation feasible to improve the execution of everyday tasks like stair climbing. Abstract: Waste management is a growing crisis with densifying population and food scrap programs. Contents of outdoor garbage bins endanger public health, having pungent pathogens attracting wildlife. A photovoltaic powered microcontroller moderated ozone treatment system was innovated to periodically and sustainably deodorize and sanitize containers. Experiments qualitatively and quantitatively verified its functionality, efficiency, reliability and feasibility for near-immediate application to outdoor garbage bins currently in circulation. Raymond Wang is an Editor on the International Student Editorial Board at the Canadian Young Scientist Journal, reviewing submitted manuscripts of research from young scientists around the world for further Ph.D review and final publication. The journal is now part of the Foundation for Student Science and Technology. The following section contains a select collection of published media features. If you are a member of the media and are looking for supplementary Photos & B-Roll material, please visit the media resources page here. IEEE Spectrum Podcast: For his innovations in tackling real world problems, Raymond Wang was featured on IEEE Spectrum's Podcast: "Techwise Conversations".